Well, we had an eventful day to say the least, arriving back at Hosteria Vallenar in a breakdown truck with Nessy on the back and us squeezed in next to the driver. 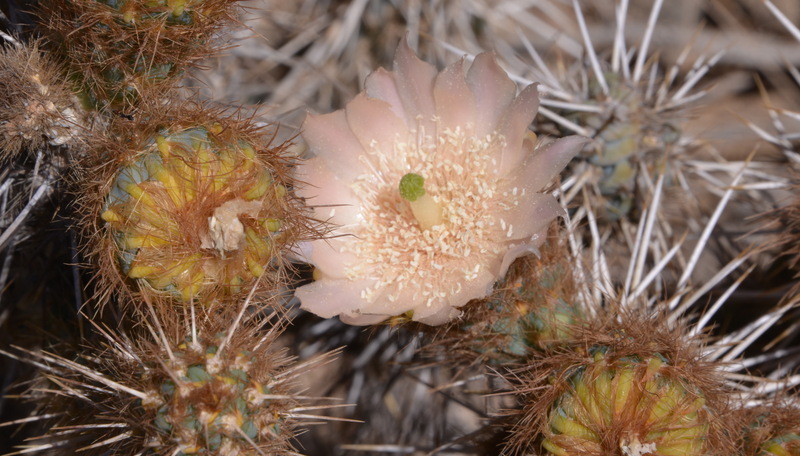 We had gone to Domeyko and stopped at km 16.4 – Ritter’s location for C. domeykoensis – these days just another C. coquimbana. 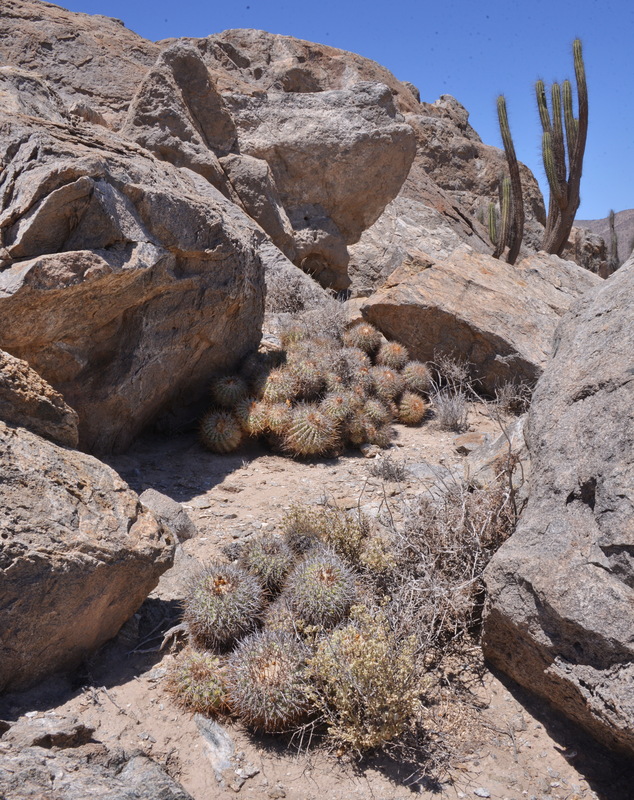 Most of the plants at the base of the rock (one of the windiest places I know) looked dead, but a bit higher on the rocks was one nice plant and when I got to that, two more a bit higher up and so on, so that I ended up much higher than ever before, nearly being blown away in the process. Very nice stop, although for the first 24 images I still had my camera set to ISO 6,400 leading to the most overexposed images ever – but amazingly still rescuable as ‘for the record’ images. Luckily I was able to retake many of the images before we drove on.(S2944). I wanted to go to take a look at the El Sarco road and when we got to the junction there was a fine compacted gravel road – rather like Argentina, that allowed speeds of up to 80 – 90 km p. hr., sign posted to El Morado. Not familiar with that name but pleased to have such a good track compared to the previous bumps & grinds, we followed it for some 40 km when I decided that something was wrong. I had stopped seeing Eulychnia chorosensis and found E. acida instead. SatNav was completely lost, floating in nothingness, but when I zoomed out it seemed to have turned north! Time to take stock. (S2945). With just one car in an area where we had seen no other car for hours on end, with time ticking on, I suggested going back the way we came – making a GPS note of our turn around time to check where we had gotten to – I expect close to Labrar and the chimneys! Back at the crossroads there seemed to be time for a nosy around Carrizalillo, where we had arrived on previous trips after a journey through very soft white sand. It seems that Nessy has limited 4×4 capability after all, but again, this was more a scouting trip to see if there was now a proper road or still a maze of tracks through soft sand. The latter! 😦 so we decided to go back the long way round, the way we had come. Imagine my surprise when some 20 km after we got back on track from the El Morado track, there was another turn, this time to Bahia Sarco – we had taken the wrong turning! Oops. We decided to leave that track (again, looking good at the junction) for another time. We might have gotten back to Vallenar around 5, in time for a double Expresso and a slice of cake opposite the old Vallenar Copec. As we passed km 16.4 again, JYC wondered if it was still windy, so I wanted to slow down to let him get out, BUT: no clutch pedal!! I used the brakes to slow down, worried that the rubber mat might have got caught over the clutch pedal but no – it seemed to have disappeared. I brought the car to a halt and let it stall – so no danger of a burned out clutch! Once I got on my knees, I found that the clutch pedal was just flopping around – either a broken cable or a failed hydraulic cylinder, what ever they use on this model. Not something you can fix with a screwdriver and a pair of nail clippers! A truck stopped and the driver took a brief look and said that the clutch cable had gone – fluent in Spanish, not English. With my limited mechanical knowledge matched by JYC, I worked out (from an old trick learned from my late father-in-law) that you can bump start a car using the starter motor to get it moving – a bit unusual, ‘cause usually a car not starting is caused by a flat battery, so no starter motor turning. I put the car in second, gave it a go and by the third turn, it burst into life! We were soon moving in second at 40 km.p.hr. at 4,000 revs – when Cliff would have shouted ‘change gear!’ but without that option available. And so we arrived at the Domeyko junction with R5, here a dual carriage way, with road works. I chickened out, 20 m before the junction – starting from Stop (Pare), crossing a dual carriage way to join the far carriageway and immediately climbing a hill was too much with the potential of huge trucks hammering down the previous hillside to kick you up the backside or worse.(S2947). There are a huge array of radio masts on the hills around the junction, so JYC tried out his mobile phone reception and we managed to speak with rental cars.com in England. Great to hear an English voice offering help, even though it was a long distance away. He would ring Santiago – ten minutes later, no calls yet – It seemed best if we rang Santiago – great, but what is the number? Nothing on any of the documents! England gave us the Santiago number, but each time we dialled it, a nice Chilean lady from Entel spoke a recorded message explaining that we had dialled the wrong number or something like that. Back to London (or was it Manchester?) on JYC’s UK phone (costs can be claimed from the insurance) who said that they were able to dial the number, listen to the message that suggested that we should insert an extra ‘2’ Ah, we had understood ‘drop the 2’ so by putting two ‘2’s in we got though. ‘Do you speak English?’ ‘Yes’ came the reassuring reply! By this time, JYC had walked to R5 where a police car was flagging down cars for routine checks on their papers. Neither spoke each other’s language, but JYC managed to persuade the officer to drive him back to our car – ‘first ride in Chilean police car by a Copiapoathoner!’ The officer was using translation software on his iPhone to facilitate the process – very clever! 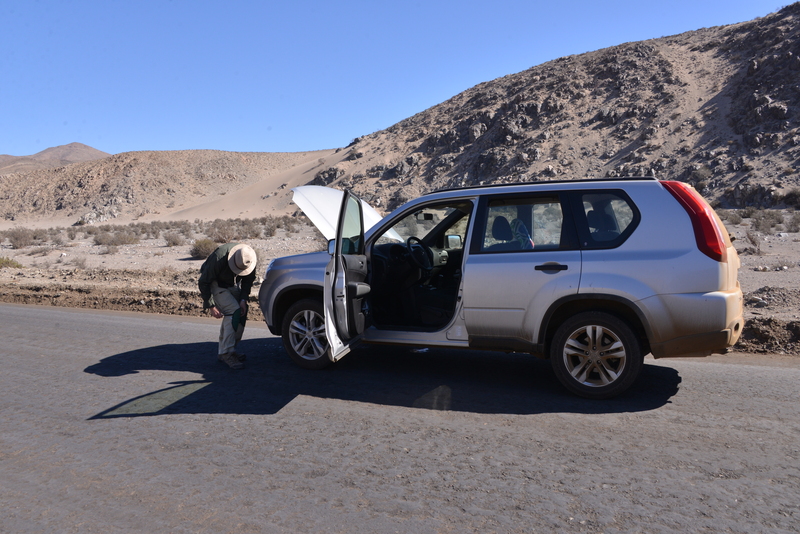 From then on in, anxiety levels faded away – our new friend in Santiago would contact a towing company in Vallenar to pick us and the car up and take us back to Hosteria Vallenar. He would ring the Hosteria, explain the problem and book us in for an extra night and he would despatch another truck with a replacement car from Santiago to be delivered in Vallenar tomorrow around midday. Wow – a very impressive service all-round! Thank you all! We got in by 22:45 with the restaurant closing at 23:00 hrs, so just made it – staff agreed to stay open for us and made us chicken and fillet steak respectively washed down with beer. All’s well that ends well! It could have been so much worse! Lucky us – again. Just the matter of waiting for a new car to arrive and we can continue the adventure.